Nobel laureate Mohamed ElBaradei is headed back to Egypt despite direct threats against his life. On the eve of his return, the former U.N. official who is the Mubarak regime's most high-profile opponent on the young people who’ve taken to the streets, political Islam, and the role of the United States. On the eve of his return, the former U.N. official who is the Mubarak regime's most high-profile opponent shared his thoughts on the young people who’ve taken to the streets, political Islam, and the role of the United States. Plus, full coverage of the protests in Egypt. When Egypt had parliamentary elections only two months ago, they were completely rigged. The party of President Hosni Mubarak left the opposition with only 3 percent of the seats. Imagine that. And the American government said that it was “dismayed.” Well, frankly, I was dismayed that all it could say is that it was dismayed. The word was hardly adequate to express the way the Egyptian people felt. Then, as protests built in the streets of Egypt following the overthrow of Tunisia’s dictator, I heard Secretary of State Hillary Clinton’s assessment that the government in Egypt is “stable” and “looking for ways to respond to the legitimate needs and interests of the Egyptian people”. I was flabbergasted—and I was puzzled. What did she mean by stable, and at what price? Is it the stability of 29 years of “emergency” laws, a president with imperial power for 30 years, a parliament that is almost a mockery, a judiciary that is not independent? Is that what you call stability? I am sure not. And I am positive that it is not the standard you apply to other countries. What we see in Egypt is pseudo-stability, because real stability only comes with a democratically elected government. If you would like to know why the United States does not have credibility in the Middle East, that is precisely the answer. People were absolutely disappointed in the way you reacted to Egypt’s last election. You reaffirmed their belief that you are applying a double standard for your friends, and siding with an authoritarian regime just because you think it represents your interests. We are staring at social disintegration, economic stagnation, political repression, and we do not hear anything from you, the Americans, or for that matter from the Europeans. So when you say the Egyptian government is looking for ways to respond to the needs of the Egyptian people, I feel like saying, “Well, it’s too late!” This isn’t even good realpolitik. We have seen what happened in Tunisia, and before that in Iran. That should teach people there is no stability except when you have government freely chosen by its own people. Instead of equating political Islam with al Qaeda all the time, take a closer look. Historically, Islam was hijacked about 20 or 30 years after the Prophet and interpreted in such a way that the ruler has absolute power and is accountable only to God. That, of course, was a very convenient interpretation for whoever was the ruler. Only a few weeks ago, the leader of a group of ultra-conservative Muslims in Egypt issued a fatwa, or religious edict, calling for me to “repent” for inciting public opposition to President Hosni Mubarak, and declaring the ruler has a right to kill me, if I do not desist. This sort of thing moves us toward the dark ages. But did we hear a single word of protest or denunciation from the Egyptian government? No. Despite all of this, I have hoped to find a way toward change through peaceful means. In a country like Egypt, it’s not easy to get people to put down their names and government ID numbers on a document calling for fundamental democratic reforms, yet a million people have done just that. The regime, like the monkey that sees nothing and hears nothing, simply ignored us. • Leslie H. Gelb: Obama’s Risky Path in Egypt• Mike Giglio: Inside Egypt’s Facebook RevoltAs a result, the young people of Egypt have lost patience, and what you’ve seen in the streets these last few days has all been organized by them. I have been out of Egypt because that is the only way I can be heard. I have been totally cut off from the local media when I am there. But I am going back to Cairo, and back onto the streets because, really, there is no choice. You go out there with this massive number of people, and you hope things will not turn ugly, but so far, the regime does not seem to have gotten that message. Each day it gets harder to work with Mubarak’s government, even for a transition, and for many of the people you talk to in Egypt, that is no longer an option. They think he has been there 30 years, he is 83 years old, and it is time for a change. For them, the only option is a new beginning. How long this can go on, I don’t know. In Egypt, as in Tunisia, there are other forces than just the president and the people. The army has been quite neutral so far, and I would expect it to remain that way. The soldiers and officers are part of the Egyptian people. They know the frustrations. They want to protect the nation. But this week the Egyptian people broke the barrier of fear, and once that is broken, there is no stopping them. 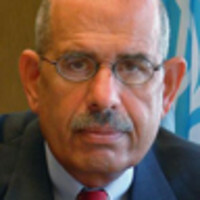 Mohamed ElBaradei was awarded the 2005 Nobel Peace Prize along with the UN's International Atomic Energy Agency, which he headed at the time. Since his retirement at the end of 2009, he has emerged as a political force in his native Egypt. His book, The Age of Deception: Nuclear Diplomacy in Treacherous Times will be published in June.